Del. 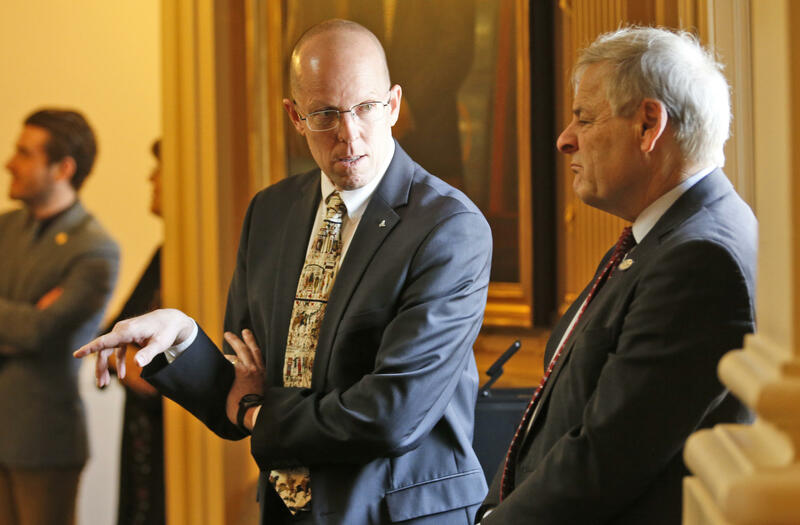 Rob Bell, R-Albermarle, left, talks with Del. David Toscano, D-Albermarle, during the House session at the Capitol in Richmond Wednesday. Lawmakers on both sides of the aisle are in agreement about getting rid of old Jim Crow language in the code. But Republicans have conditions. Lawmakers here in Richmond are totally fine with getting rid of exemptions to the minimum wage for shoe shine boys and theater cashiers — low-wage jobs that were commonly held by African-Americans in the Jim Crow era. But Republicans have conditions. They want assurances from Governor Ralph Northam that he won’t amend Delegate Cia Price’s bill to raise the minimum wage for everybody else. Kim Bobo at the Virginia Interfaith Center for Public Policy says she would like to see the minimum wage increased. But she says she’s fine with Republicans seeking assurances from the governor before they move forward. The governor’s office says Northam reserves the right to review every piece of legislation passed by the General Assembly, adding that it’s his constitutional role in the process.